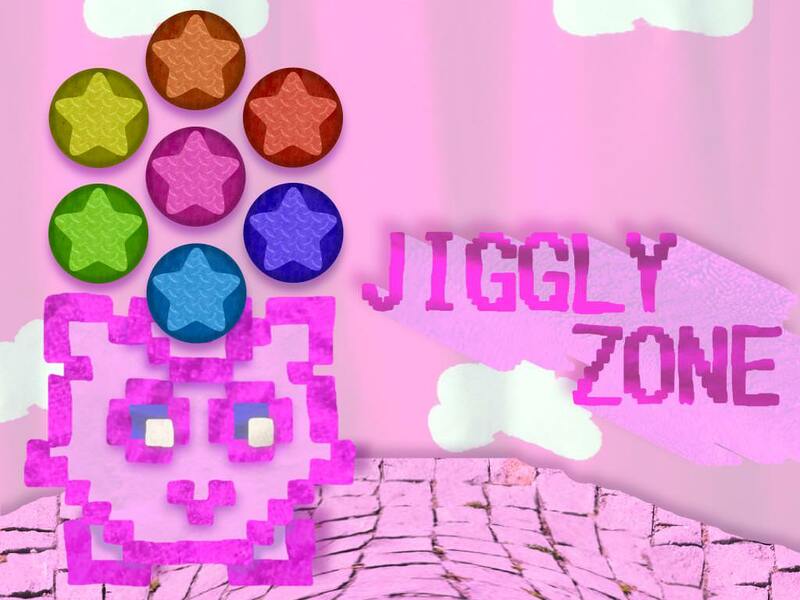 JIGGLY ZONE is an exploration platformer made by sylvie, creator of Cat Planet, and hubol, creator of Craz'd and 2. Since raocow has played some of our games in the past, we thought there might be some interest in it here. 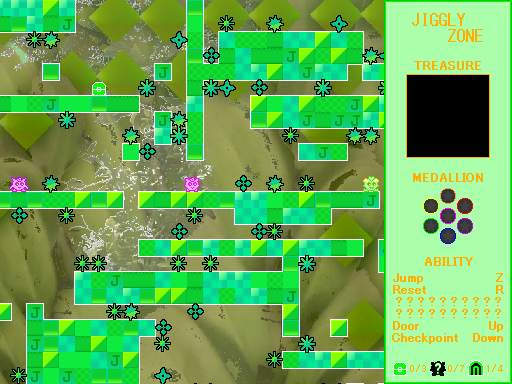 JIGGLY ZONE can be played on Windows PCs or in web browsers, but save files are not compatible between versions. If you aren't sure which version to play, the Windows one is likely to run more smoothly. Don't try playing this one with a Logitech, if one thing isn't going wrong, it's another. Grounder, that's not a great bug report. Did you have any specific issues? Also "a Logitech"? Is this a computer? A mouse? A printer? Or some other amazing hardware? Last edited by hubol on 25 Mar 2018, 16:41, edited 1 time in total. Were you playing the web version or the Windows version? If it was the web version, does your gamepad work correctly on http://html5gamepad.com/? Do you know whether your gamepad uses XInput or DirectInput? If it's still broken, I guess you can use Joy2Key..... sorry! Yes, the web version works with the gamepad now. Okay, what the hell happened at the end? Is it, like, a fakeout, or...? The hour of JIGGLING is near.... raocow will be playing this game pretty soon, unless he decides to play Hollow Knight without the DLC first or something. For this reason, I've released a small update that fixes some bugs, tweaks the levels a bit, introduces new bugs, etc. The download/play links are the same as in the original post. sylvie wrote: ↑ The hour of JIGGLING is near.... raocow will be playing this game pretty soon, unless he decides to play Hollow Knight without the DLC first or something. Oh god, I think I found an inescapable situation. For some reason, there seems to be no way to go back to the Entrance of the Crimson Isles once you enter the Mouth from the Stomach, at least not without the spike power-up (which I lacked at the time). Even if I managed to make the jumps and cleared the spikes, there's no way to shift gravity mid-air so that I can catch my footing on the top doors. I'd have to get extremely lucky and hit up just as I pass over them. Notice at the top there are spikes that prevent me from landing below the doors without the spike powerup. Also, there's a pit at the very top of the screen, so no catching myself there either. Also also, it's not possible to just get the powerup by entering the Final area from the Heart. I have to enter from a different area in the Lavender zone to access it. If you want to back out, you have to do an extremely difficult jump sequence like you said. You don't have to press up with good timing though; if you touch a door with no checkpoint set, it will automatically set your checkpoint to that door. So you can just clip the edge of the right door and you'll respawn there, but the jump sequence is still very precise. since it's supposed to be the "final area". I'm not sure if I'll patch the game to make it more easily escapable, since I'm a little tired of working on it, and I'm also not sure of the best way to add an easier escape route to that part. Ah, right, I forgot I had the ghost powerup in the Final area. Silly me. Well, at least I managed to make it all the way through and get the spike powerup. Now to find those last two treasures and clean up some extra stuff. the 3 that you can see directly left, down, and right of the lower door, and the 1 that's right by the upper door. I've tried following the entire border of this spike maze and everything just leads to a dead end and I haven't seen any trace of this 5th jiggly at all. There's clearly more of the room that I haven't been to (mostly the upper right), but as far as I can tell there's no way to get there, and there's no other entrances to this room besides the 2. 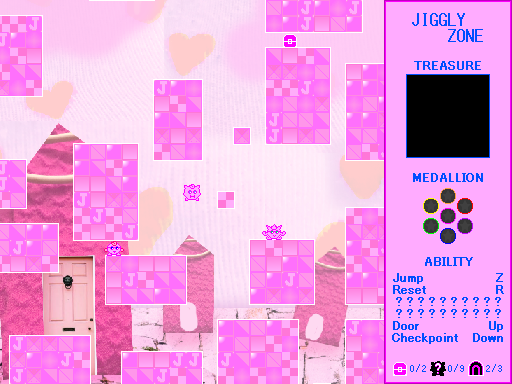 2) My game is bugged and the 5th jiggly doesn't actually exist in this room. Can someone tell me whether my first assumption is correct, that there should just be another path in the Descent room I haven't found yet? Or if that's not it and there's another mysterious trick to getting this 5th jiggly then maybe a subtle hint would be nice. I just read the spoiler in the previous post and learned about the spike ability. That takes care of that. Also I somehow forgot about going overtop of the screen, and found out it's possible to get to that jiggly even without the spike ability. Last edited by warpio on 19 Aug 2018, 19:10, edited 1 time in total. The bottom of Crimson Islands. I assume the spike power must be around here somewhere but I've explored everything I can in Mouth, Stomach, and Heart and there seems to be nowhere else to go and there's no way to get back up through Mouth. Everything in the Heart room except for that one chest is way too high up and there's no blocks to use to refresh my jumps. You might be forgetting about the gravity powerup, which is required to get through the Heart. You'll also have to do some blind jumps, but it's possible. the second quest, since we get the powerups in a much more interesting order. I just wish there were some sort of global JIGGLER counter kinda like there is one for treasures. I'm still not sure I talked to every JIGGLER. The soundtrack was really good as well. , I wasn't really sure if people would find it fun.